Dr. Michael R. Cunningham, Chancellor of the National University System celebrates with marathon legend Meb Keflezighi after the 2017 NYC Marathon. This month, we celebrate National Philanthropy Day, which makes me think of some of the ways the National University System serves the nonprofit community. 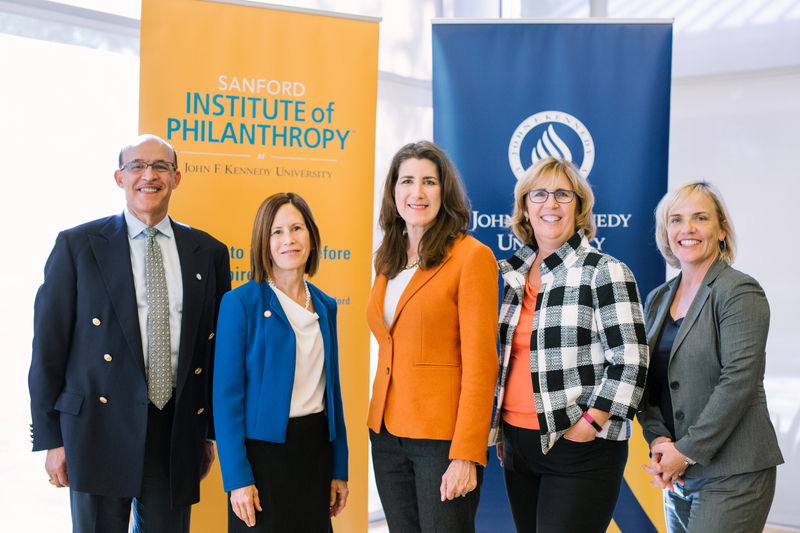 Recently, the Sanford Institutes of Philanthropy at National University, City University of Seattle and John F. Kennedy University held symposiums and community events to raise awareness of the importance of supporting nonprofits. A primary function of the Institutes, which have expanded to other universities around the country, is to help nonprofits improve their fundraising skills and donor relations to be even more impactful in the work they do for our communities. The Institutes, which were inspired by the vision of renowned philanthropist Denny Sanford, a man who greatly inspires me, exemplify both Denny and the National University System’s steadfast commitment to building a better tomorrow through education and philanthropic endeavors. Furthermore, Denny’s contributions have helped our universities further their mission of providing an exceptional student experience. Please consider joining Denny in his support of providing educational opportunities to students through a donation to one of our universities: National University, City University of Seattle and John F. Kennedy University. 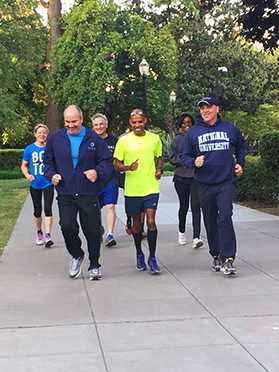 Chancellor Cunningham runs in Capitol Park with Meb Keflezighi and members of our National University System Board of Trustees and Administrators. We can all find ways to make a difference in the lives of others through our time, talent and treasure. A few years ago, Denny invited me to the Epilepsy Foundation of San Diego’s Gingerbread City Gala, an event that raises awareness and support for programs and services that improve the quality of life for those with seizure disorders. Having lost my mother from complications of a seizure disorder, I know from personal experience the difference these services can make in people’s lives. This year, I am humbled to be the Gala’s chair and will match every dollar raised by NUS faculty, students, staff and alumni. Visit the Epilepsy Foundation website to learn more. And as our hearts go out to everyone dealing with the aftermath of recent devastation due to hurricanes, tragic shootings and wildfires, I encourage everyone in our NUS community to think of ways we can support the relief effort by connecting with organizations such as the American Red Cross. I’d also like to encourage you to direct your gifts to very important children’s and health causes such as the American Heart Association. I’d also like to recognize another friend of the National University System, who is dedicated to helping others, as we know from his speeches at two National University commencement ceremonies. Marathon champion and Olympic medalist Meb Keflezighi ran the final marathon of his career in New York City the weekend of November 4-5, and I was thrilled to join Meb in New York to cheer him on behalf of all of us. Meb, who ran the 2014 Boston Marathon in honor of the victims of the Boston Marathon bombings in 2013, has always been committed to helping others go the distance in their own lives. 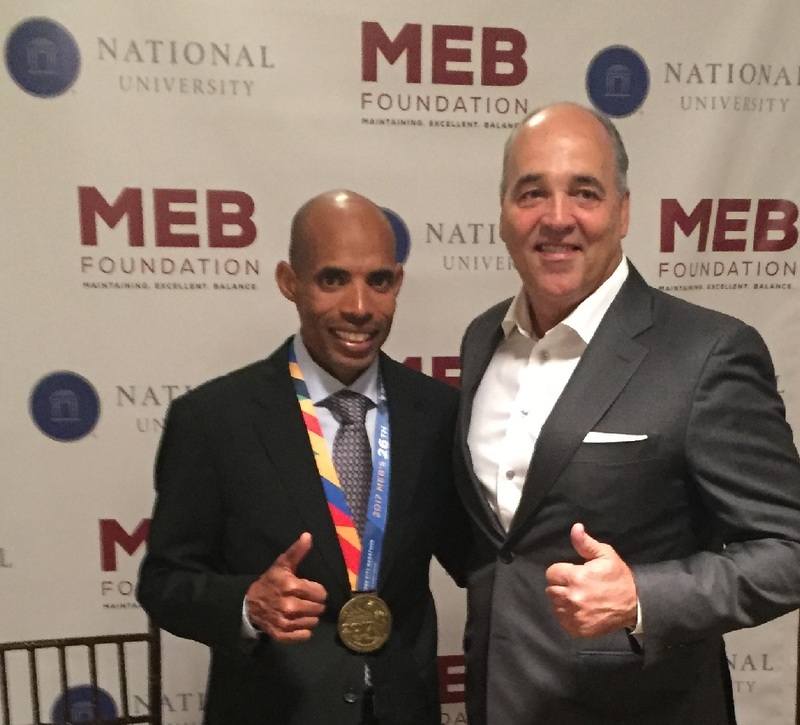 Meb is an inspiration to us all and as he worked toward achieving his goals, he developed the MEB (Maintaining Excellent Balance) Foundation, which is committed to helping youth overcome challenges and achieve their goals. Pictured L-R: JFKU SIP Director Solomon Belette, JFKU President Debra Bean, Assemblywoman Catharine Baker, Andeavor Director of Gov’t & Public Affairs Patty Deutsche, and Kristin Connelly East Bay Leadership Council. There are so many ways we can make a positive impact in the lives of others. I encourage everyone in our NUS community to let these examples inspire you to make a difference and consider the ways you can give back.